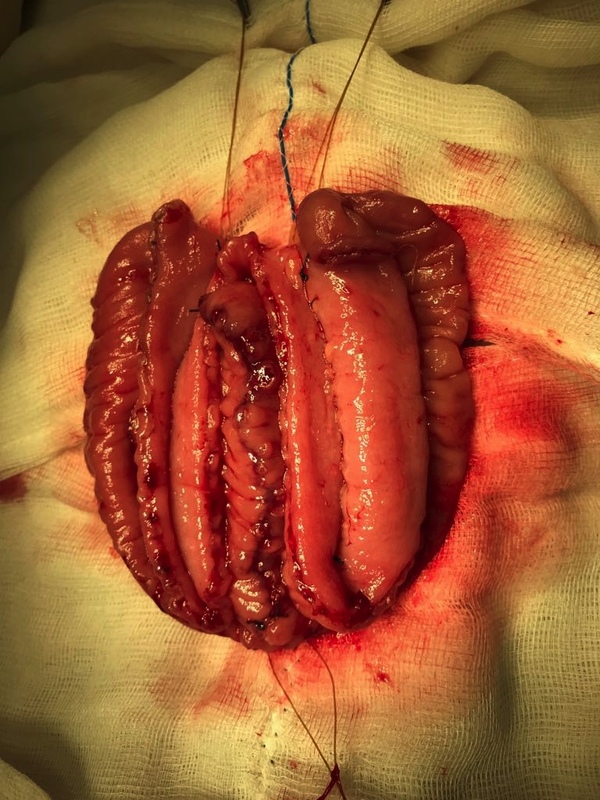 W-shaped ileal orthotopic neobladder with serosa lined tunneled uretero-ileal anastomosis (Ghoneim’s pouch): Short term oncological, functional and urodynamic outcomes. 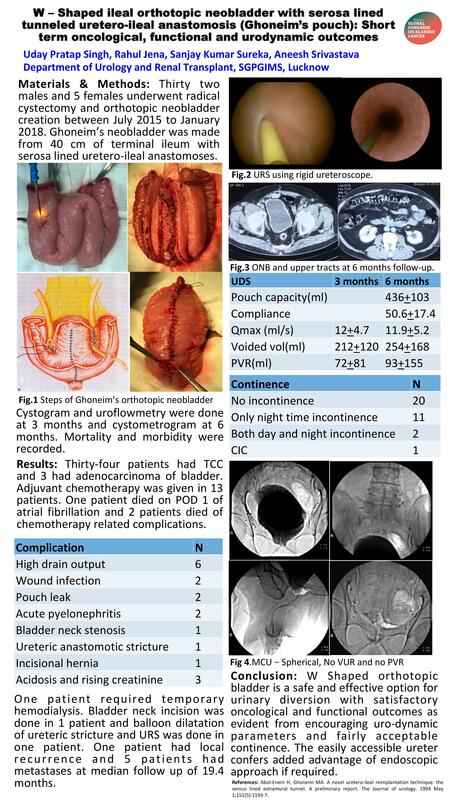 Introduction: We present the short-term oncological, functional and urodynamic outcomes of W shaped ileal orthotopic neobladder (Ghoneim’s pouch) following radical cystectomy. Materials and methods: Thirty-seven patients who underwent radical cystectomy between July 2015 to January 2018 were enrolled. At first, follow up, uroflowmetry and cystogram were done. Urodynamic studies were done in few patients at second follow up. Pouch related quality of life was assessed using a published questionnaire. Cancer-related mortality and morbidity were recorded. Results: Thirty-two males and 5 females underwent radical cystectomy and orthotopic neobladder. The mean age was 58 years. Thirty-four patients had TCC and 3 patients had urachal adenocarcinoma. The length of ileum used was 40 cm. One patient died on post-op day 1 of atrial fibrillation and 2 patients died at postoperative month 1 and 2 respectively of chemotherapy-related complications. The most common postoperative complication was high drain output in 6 patients. 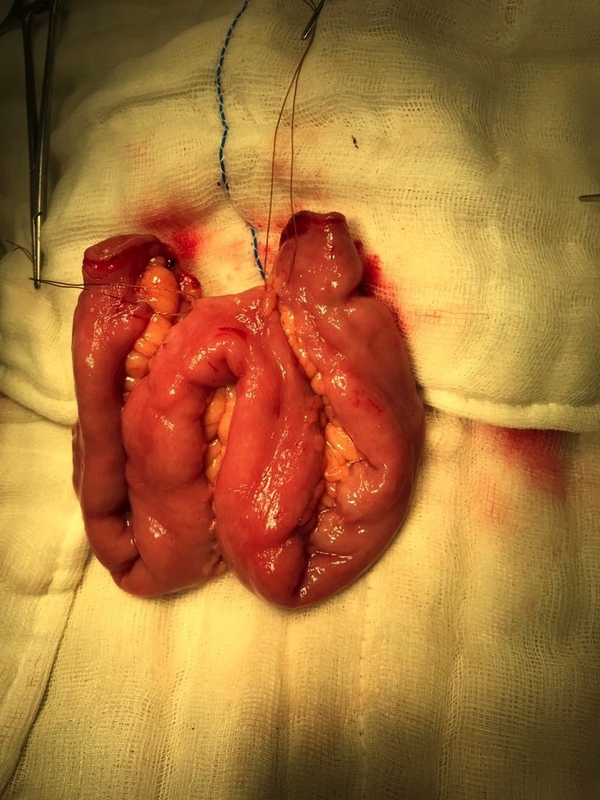 Two patients each had wound infection and pouch leak managed conservatively. Adjuvant chemotherapy was given to a total of 13 patients. The mean length of follow up was 19.42 months. At first, follow up, 3 patients had developed acidosis on blood gas analysis and rising serum creatinine, with one requiring temporary hemodialysis. 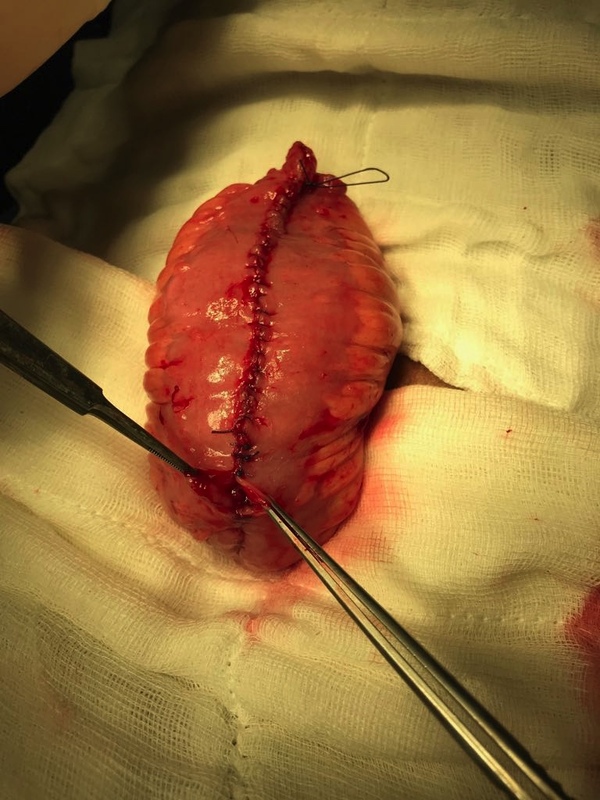 Two patients had acute pyelonephritis before second follow up and 1 patient had urethral-pouch anastomotic stricture, which required a bladder neck incision. Balloon dilatation and ureteroscopy were done for ileo-ureteral anastomotic stricture and mesh repair for an incisional hernia in one patient each. Upper tract changes were observed on follow up CT scan in only one patient. One patient had a local pelvic recurrence and 5 patients had metastases at a time ranging from 6 to 35 months. During first and second follow-up, maximum flow-rate, voided-volume and post-void residual urine were 12+4.7 mL/sec, 212+120 mL and 72+81mL and 11.9+5.2 mL/sec, 254+168 mL and 93+155 mL, respectively. The mean pouch capacity and compliance were 436+103.5 ml and 50.6+17.4 ml/cm H2O. Twenty patients had no incontinence at 6 months, 11 had incontinence only at night and 3 patients had both day and night time incontinence. Only 3 patient required CIC transiently. Conclusion: The Ghoneim’s pouch has a low complication rate and near-normal storage capacity and voiding pattern, with ease of doing endoscopic upper tract surveillance.